SOLIDWORKS Visualize can show off your designs with photo-realistic renders, even when it comes to rendering transparent liquids. To demonstrate the beauty of such a realistic rendering of liquids, see how we created the perfect margarita glass step-by-step to celebrate Cinco de Mayo. 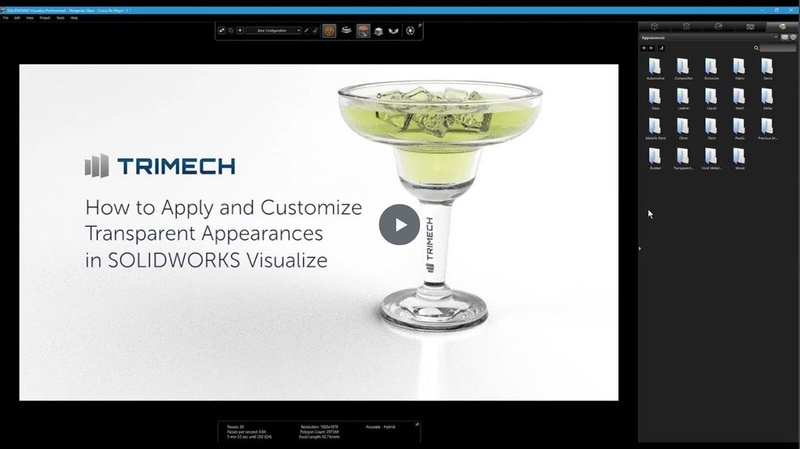 In honor of Cinco de Mayo and its infamous activities, we decided to demonstrate how to create a signature TriMech margarita from start to finish in SOLIDWORKS Visualize. This shows how to render transparent liquids inside of a transparent glass structure while keeping the refraction and light reflection intact. Rendering transparent materials is a key advantage of Visualize over other 3D rendering software. Being able to adjust the Camera Settings and apply different appearances allows control over the nuances of light reflection and transparencies. See the appropriate Camera Settings listed in the image below. Now, for the trick of applying a decal to a curved glass stem, simply adjust your decal settings, and apply an appearance to create the look of a real glass. 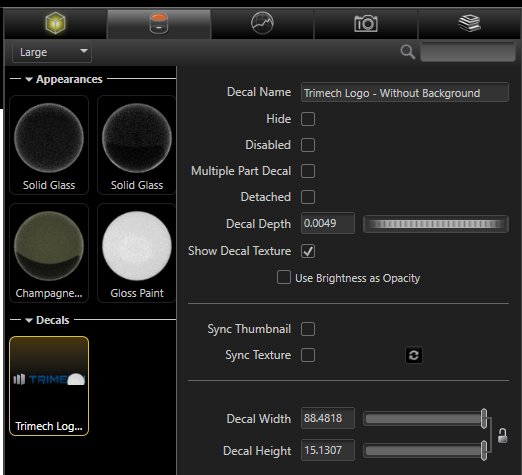 After applying the TriMech decal the margarita glass stem, the only setting that you need to adjust is the Decal Depth. Increasing the depth of the decal allows for the entire image to be shown as it bends around the curved surface of the stem. Decals do not come with an appearance/texture when initially applied to the model. With a simple drag-and-drop, we can apply a Gloss Paint appearance to the decal, which gives us the ability to adjust clearcoat and roughness settings which enables the decal to reflect light from the environment and blend more realistically with the model. Setting the Gloss Paint appearance color to pure white allows the colors from the decal image to show through in their original colors. 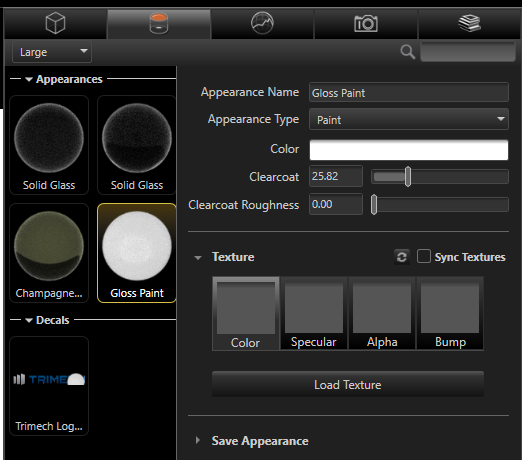 See the appropriate settings for the Gloss Paint Appearance in the image below. 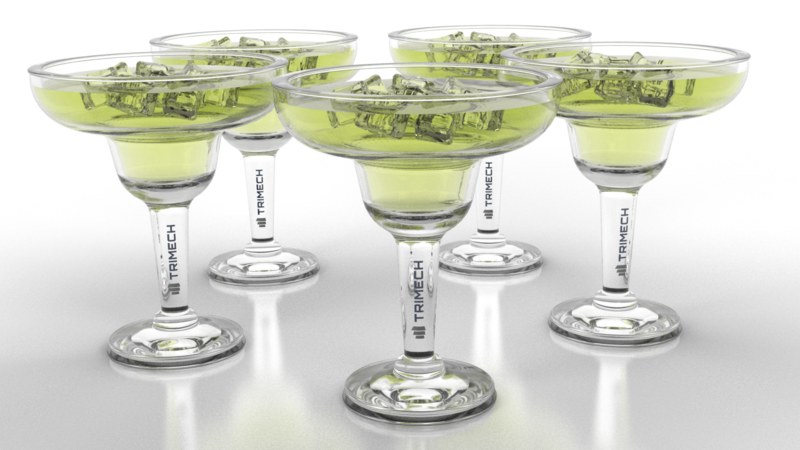 To create the appearance of a realistic margarita glass, you apply a Solid Glass Appearance to your image. I used a Solid Glass appearance for the margarita glass. This appearance has the "Solid" setting enabled by default. Using a Solid appearance gives us the ability to adjust the Color Density, which allows the environment lighting to penetrate and illuminate the appearance as it would in real life.The higher the Color Density, the more light will pass through the appearance. After some adjusting, I used a Color Density value of 2000. The final value of the Color Density will vary depending on the brightness of the environment and the darkness of the applied color. To begin, follow the settings in the image below, and adjust as needed. I created a copy of the Solid Glass Appearance and applied it to the ice cubes. Using a copy of the appearance allowed me to adjust the settings for the ice cubes independently from the glass itself. After experimenting with various appearance settings, it turned out using the same settings as I did for the glass gave me the most realistic look of an ice cube. This is a good time to talk about the Index of Refraction (IOR) setting. Adjusting this setting controls the degree of refraction, which essentially controls the degree of which the environment lighting bends/warps as it passes through the appearance. The higher the value set for the IOR, the more the light will distort as it passes through the surfaces of the ice cube geometry. The ice cubes were modeled so that every face had curvature, which produced very realistic reflections and refractions. When rendering a model with organic shapes such as ice cubes, it is best to avoid planar surfaces whenever possible, as flat surfaces won't scatter the light as it would in a real ice cube. See the Solid Glass Appearance settings used for the ice cubes in the image below. 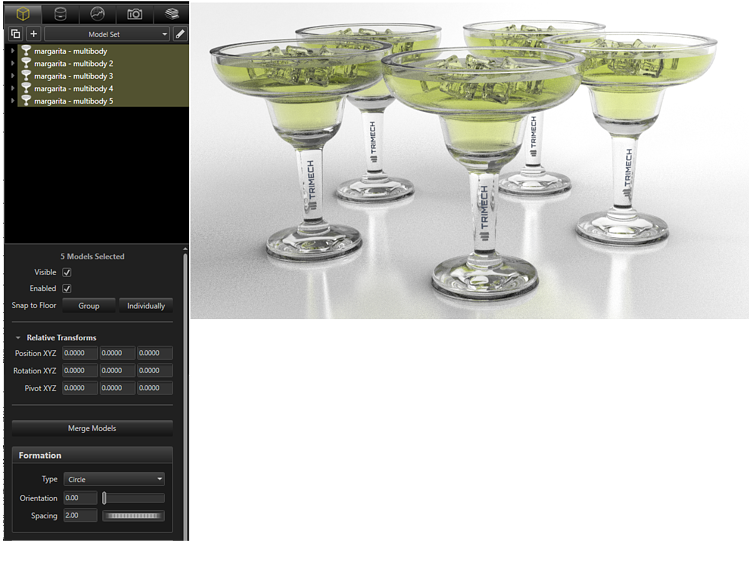 I chose the "Champagne" appearance from the Visualize Cloud Library to use for the appearance of liquid within the glass. 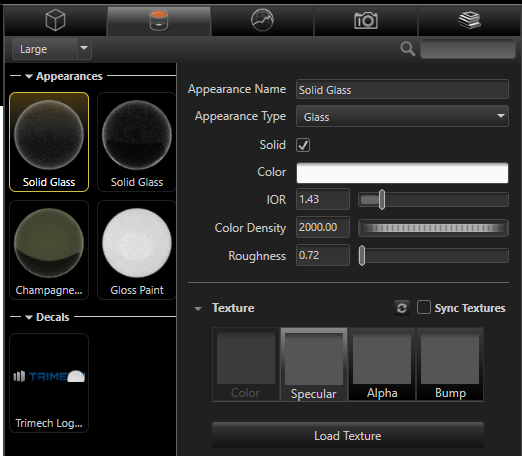 Like the Solid Glass, the Champagne appearance uses the “Glass” appearance type, giving us the same options for setting the appearance as a solid and adjusting the IOR and Color Density values. The Champagne appearance differs from the Solid Glass because it also has a Specular texture applied. This texture is built in to the appearance to give the look of bubbles within the Champagne. The Margarita does not have bubbles, but I was able to scale down the size of the texture (bubbles) to add a subtle cloudy look to the liquid. Using appearances that include textures like Specular will greatly help in boosting the realism of the appearance and how it interacts with the environment lighting. 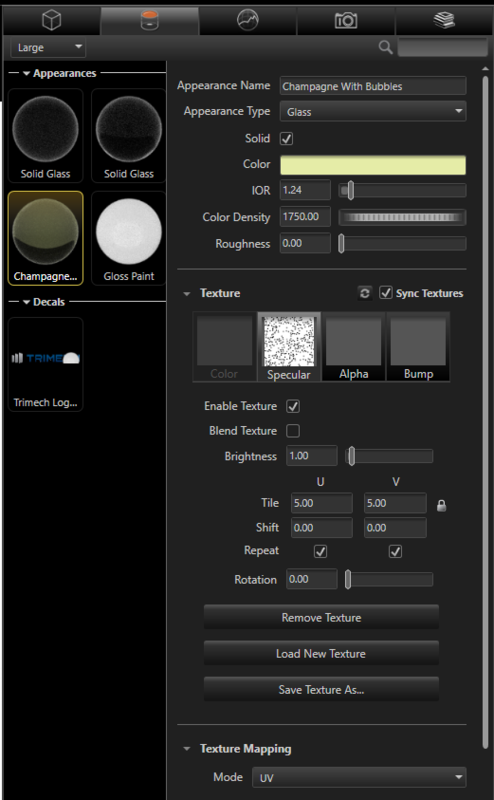 See the Champagne settings in the image below. After we are happy with how the margarita looks, the obvious next final step is to create more margaritas to share with friends. An excellent feature in Visualize is the Formation tool. This tool allows you to pattern copies of the model in specific arrangements. The first step to creating this formation is to copy/paste the margarita model to create the desired number of margaritas. I created four additional copies for a total of five margaritas. After we have created the multiple copies of the model, the next step is to select them all and create a formation. There are various formation patterns that can be applied and I chose to use the Circle formation and increased the spacing value so the models did not overlap. With models and camera positioned as you want, the last step is to render. 20-minute webinar by clicking the button below.